Shelly and I do a lot of traveling around the mid-Atlantic region. Every time we're out on a road trip we like to seek out street art, wall murals and roadside attractions. What's really nice is that you can find them in just about any small town or large city. Some of this art was done solely by one artist or a group of artists from that local community. While on a road trip through the great state of New Jersey we took the time to go see Lucy the Margate Elephant in Margate City. If you're unfamiliar with the area you'll find Margate City 5 miles south of Atlantic City (between Atlantic City and Ocean City) in New Jersey. Lucy was constructed in 1881 by James V. Lafferty from tin sheeting and wood. He constructed her to bring attention to real estate sales and to draw tourists to the local area. 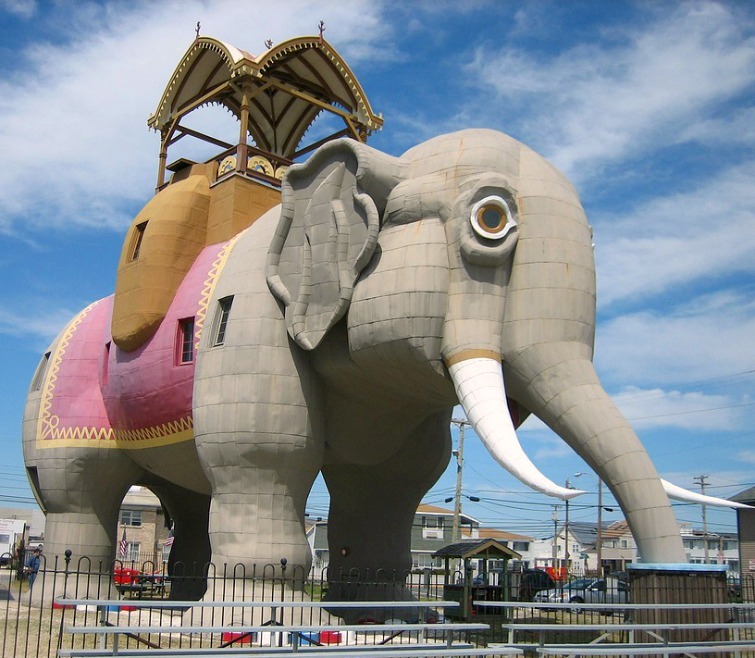 These are shore towns that sit along the Atlantic Coast and millions of tourists have stopped by to see Lucy the Elephant over the years. She's a National Historic Landmark (November 2011) and is listed on the New Jersey Register of Historic Places. Lucy the Elephant is the oldest surviving roadside tourist attraction in America and is listed as the 12th tallest statue in the United States. Overall she stands 65 feet tall by 18 feet wide. There are 22 windows in the building. We travel down to Ocean City, Stone Harbor, Wildwood and Cape May in New Jersey several times a year. If you're heading down to the South Jersey Shore you can easily find Lucy in Margate City, especially if you're taking the Garden State Parkway down along the coast.